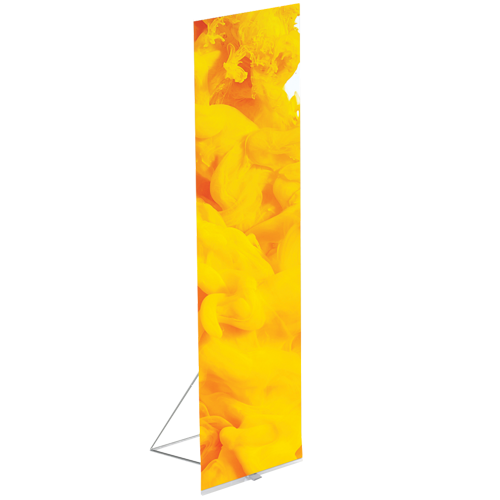 Simple, stunningly good looking, stylish – banner stands are still one of the most popular, effective and easy ways to promote our company, product or services. They allow you to get your message across in a wide variety of ways and are ideal for all environments. With one of the most comprehensive ranges of makes in the market, our banner stands and graphics are designed to meet everyone’s budget and needs. So if you require a one-off single use to multiple uses, need to frequently change the message we have a banner stand just right for you. These can be modular and linkable to create any size and shape or are ideal as stand-alone displays. Tension banner stands allow for quick and easy changes of graphics. Many of our units come with a sturdy nylon carrying bag for easy transporting. 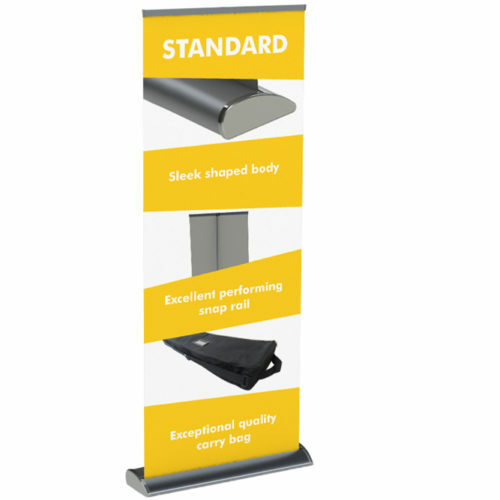 Our Telescopic banner stands allow for a visually striking display and are ideally suited if you are looking for a professional seamless display at exhibitions, trade and road shows, or in shopping centres and forecourts. These stands are different from roller banners as the graphic can be removed easily from the unit and replaced without buying a new stand. 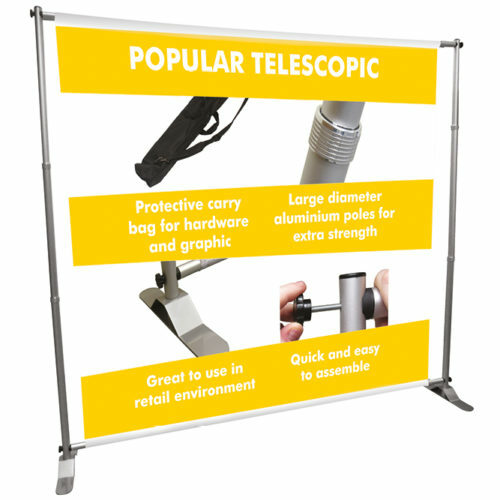 Telescopic banner stands have adjustable telescopic poles which allow for a number of height and width options. Free-standing tension stands are manufactured from strong, yet lightweight 30mm diameter aluminium tubing and dressed in a washable zipped tension fabric. 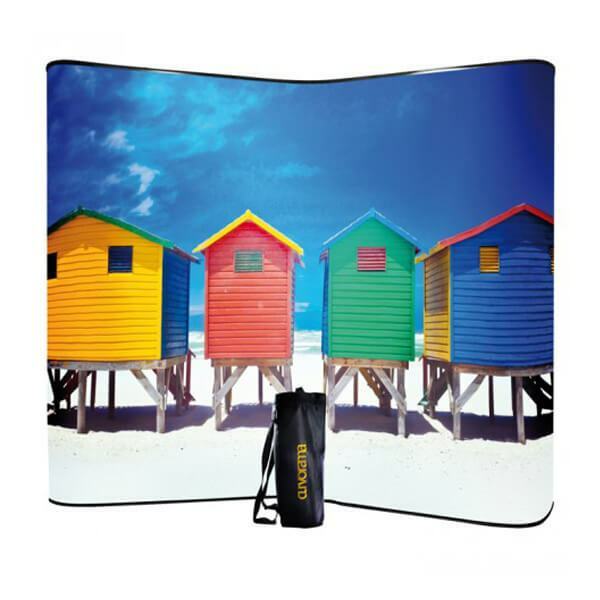 They come in a variety of shapes and sizes and are the latest innovation in banner stands. They are eye-catching and simple-to-erect display systems. Their modular design means it is an extremely versatile system as multiple stands can be linked to create larger displays and configurations to meet a vast array of design needs. One of the easiest way to have a different look every time. This system will make the most of any display opportunity by instantly adapting to fit any venue. Instant, self-aligning joins and counter-balanced curves mean that Curvorama is quick and easy (and tool-free) to set-up.